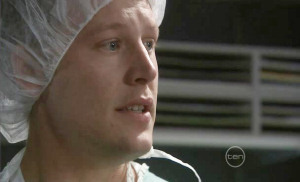 Marco begging Carmella to have an epidural but Ollie butting in to say that isn't what Carmella wanted. 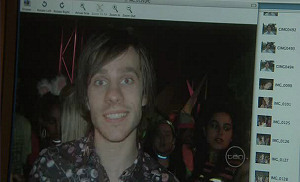 Tim announcing his plan to bid for No. 26 so he can demolish it and build 3 townhouses instead. Brad giving Elle & Riley 48 to convince him not to sack them. Dr Olenski telling Carmella that she needs a caesarean as the baby is showing signs of distress. Olenski is about to deliver the baby and Ollie tells Carmella that she is out but the baby is having problems breathing and so the medics spring into action. Carmella gets upset but as per usual sheds no tears. Frazer suggests names for baby C to lighten the situation but Rosie and Marco are too worked up to pay attention to what he is saying, so he changes tact to reassure them that baby C will be okay and he'll be using his credit card to pay for some toys. Rebecca, Paul and Elle arrive looking for news but there is none, so they chat about Elle being discharged from hospital instead. The medics are still working on baby C as she can't breathe due to still having some of the amniotic fluid in her lungs, a side-effect of a C-section. Calmly, Olenski says that bubs will be moved to the Neonatal unit but both parents are worried as hell. The gathered (minus Paul & Elle) react when they see an incubator being pushed out of the theatre and Ollie fills in the blanks when he emerges but only gives them the bare info as he wants to follow the incubator. Carmella wants to see her daughter but Olenski tells her no as she isn't up to the journey yet and departs to check on baby C. A nurse reassures Carmella as Rosie is led into the theatre to continue that reassurance as mum begins asking questions about her daughter. 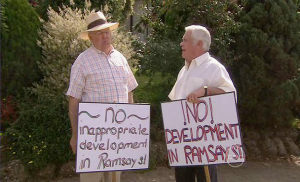 Harold and Lou are knocking posts into the grass saying that they are against any development taking place in Ramsay Street although the pair squabble over how they say ‘no'. They stop squabbling though when they see Elle arrive home from hospital and offer their help to get her into the house, which she rejects. 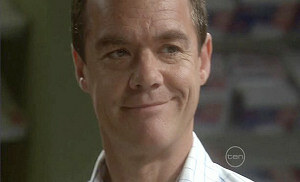 Frazer tells Marco that Mrs C is on the way home, adding that is the last thing Carmella needs. 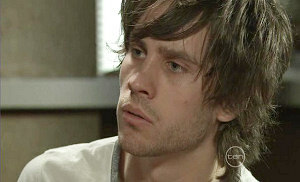 Marco is still worried to death over everything that is happening but Frazer reassures him that Carmella needs him. To change the subject slightly, he asks Frazer if they want kids soon and he replies that he would like them but Rosie isn't so keen and adds that ‘this' isn't helping either. Elle is trying despite Paul's best efforts to get back to the swing of things but he hauls her laptop away from her so she can properly rest. Her resting is totally curtained when she gets he heckles up over the article in the paper about the rave and what it doesn't contain and picks up the laptop again to start writing an article to give to Brad. Paul totally snaps and shouts at his daughter. PAUL: I nearly lost you because of that damn job. Elle explains with the help of her fingers how close she is to getting the sack and Paul wants her to go back to working at Lassiter's. That isn't what Elle wants and explains to him that she has found her passion and adds that it was the dodgy warehouse that was the problem, not the job. Much to her annoyance, Carmella is still firmly lying there even though she wants to go and see her daughter. Rosie continues to say positive things but all Carmella can think if is that no news means bad news and begins to wonder if it was her addiction that has led to her baby having problems. Rosie tells her to stop thinking like that, that the baby will make it which upsets Carmella even more and if you look close enough you can see a bit of a sheen in her eyes but predictably, she can't actually cry. Susan and Miranda walk though the park talking about how their respective kids are coping following the collapse and its news to Susan about the memorial service for Jessica that the teens held. The pair head for the shade when Susan explains that the heat is getting to her (heat sensitivity is part of her MS symptoms) and Susan asks that she not tell Karl so he doesn't delay starting work to look after her. Miranda says that she has Libby but Susan replies that she is heading back to Shepparton with Darren. “And how do you feel about that” asks Miranda who is obviously puzzled given what she knows (the Darren/Janae kiss) and Susan doesn't before they head for somewhere to have a cool drink. Elle is having fun working so doesn't mind Rebecca heading back to the hospital so leaving her alone (Paul has gone to work and Declan is at Ringo's). She show's concern for her ex by asking how Ollie is and Rebecca replies that he is being a real rock for Carmella. “And you're being a rock for him,” replies Elle before adding she is there if she needs anyone. When Rebecca leaves, Elle starts to look through pics on her laptop and has a flashback to the accident when she goes though pics of Riley. Carmella is demanding to be allowed to go and see her daughter but Rosie explains that the epidural hasn't worn off so she can't move. She asks Rosie if she saw baby C but Rosie explains that she was whisked by so quickly she couldn't see but as Carmella is starting to get worked up, the nurse brings her in a photo of her daughter, which calms mum down. Things finally get to Rosie and she makes a bolt for the door on the pretence of getting ice but runs straight into Frazer who enfolds his wife in a hug. Lou is getting the customers to sign their petition before he hands them their change (and scarily, from the back she looks so much like ScaryMary but when she turns it thankfully isn't her) and Harold has a go at him for it. 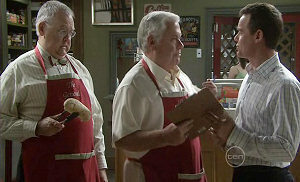 Paul comes in for some tomatoes but Lou wants a signature before he goes to look for some again earning a ‘Lou' from Harold. 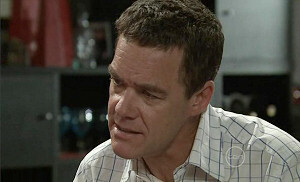 Harold enquires if there is any news about Carmella but Paul hasn't any as Rebecca's phone is switched off. Riley enters the store and asks Paul if he can go and see Elle and he gives his approval readily thinking it will get Elle to stop working on the article for Brad. His mood deflates though when Riley says he is doing one too, to help save his job, and agrees that his visit will be social only. Frazer updates Mrs C on the phone but hangs up when a tearful Ollie comes out to update them. He says that baby C has a type of pneumonia and being premature isn't helping as her lungs are so tiny. OLIVER: The doctor says she' got a fight on our hands. He asks Marco to come with him to see Carmella. ELLE: I don't see why there can't be a female Rupert Murdoch or why she can't be me. The nurse is checking Carmella over who is busy studying the pic of baby C wanting to know when she can see her and is told that they need the go-ahead from the nursery first. Marco and Ollie enter the room and he updates her on their daughter's progress but Carmella can tell that something is up. Eventually and with tears in his eyes, he manages to tell her that their daughter has RDS (respiratory distress syndrome) and still requires help with her breathing. Carmella (who is attempting but failing to cry) demands that the men help her out of the bed so she can see the baby but they persuade her to stay put as the epidural hasn't worn off yet but as soon as it does they will take her. Elle comes off the phone from talking to Brad about the article she wants to do about the collapse much to Paul's annoyance that she is still working. Riley calls round and Paul leaves him to babysit his daughter, which she tells him she doesn't need when Paul leaves and instead gets him to make her a cup of coffee. Elle asks what he is working on and he replies it isn't model boats! She takes a look inside his folder and sees it is an article about him in the collapse and the camera zooms in on the bit that says ‘trapped with the girl I love' and we can see Elle breathing in sharply before she has another flashback to Riley holding her while they were trapped. Frazer is back on trying to get a name for baby C and suggests Victoria but Rebecca comes in with an update from Ollie although it isn't much of an update, just that baby C isn't getting any worse. Carmella demands that they get her a wheelchair so she can see her daughter and to make them see she is serious, adds that she will crawl there if necessary. Riley asks what she thought of the article and the by-line and explains to her that life is too short and that he wants to be with her. Elle then has another flashback to them trapped which seems to confuse her and asks that Riley leaves. ELLE: I want to be a journo, a really good one. ELLE: No, I don't want you or dad or anything to stop that. I don't like you Riley, not like that. Riley looks like the roof has just fallen in on him again but takes it like a man, saying ‘c'est la vie' but does get a still confused Elle to agree to working with him on their articles. Surrounded by family members Carmella at last gets to see her daughter.